The knee joint consists of two main bursa (Figure 1), the subcutaneous prepatellar and superficial infrapatellar bursa. Collectively, they are both commonly referred to as the prepatellar bursa, but nonetheless are anatomically distinct. 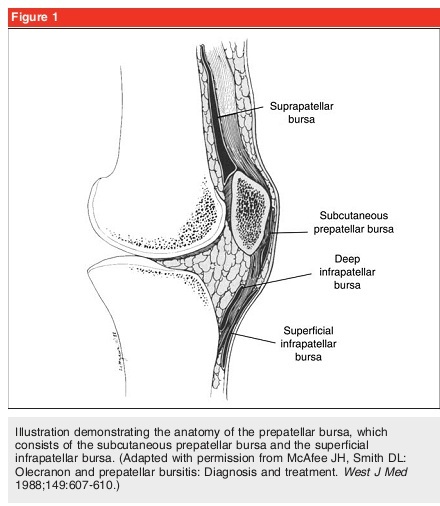 Specifically, the subcutaneous prepatellar bursa is located between the epidermis and the patella, while the superficial infrapatellar bursa lies between the epidermis and the tibial tubercle. The infrapatellar bursa does not contact the knee joint itself, but functions to decrease trauma to the patellar tendon during kneeling or jumping. In the absence of a disease, the bursa contains minimal amount of fluid and is not visible on imaging. Bursitis can be caused from either an infectious or noninfectious source and are referred to as septic bursitis and aseptic bursitis respectively (Box 2). However, distinguishing between the two forms of bursitis is difficult. Although bursitis can arise from many inflammatory causes, bursitis secondary to infection is a concern. Approximately 80% of septic prepatellar bursitis is attributed to Staphylococcus aureus. However, many different organisms and fungal species have been indicated as pathological causes. The mechanism of infection is likely due to direct inoculation, not hematogenous seeding since there is usually poor blood supply to the bursa. The mechanisms of aseptic bursitis include trauma, gout, sarcoid, idiopathic calcification, calcinosis, Raynaud’s, esophageal dysmotility, schlerodactyly, and telangiectasia syndrome. Chronic bursitis can occur and is associated with repeated minor trauma and with occupations that involves repetitive and prolonged kneeling. Price N. Prepatellar bursitis. Emerg Nurse. 2008;16(3):20-24. The diagnosis of bursitis is greatly based on the clinical presentation and risk factors of the patient. 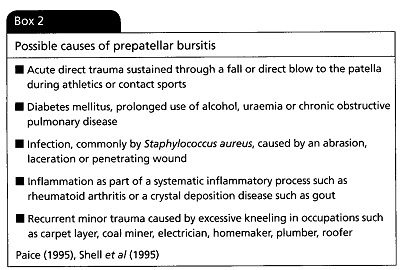 Predisposing factors of bursitis includes a history of trauma to the area, repetitive microtrauma, prolonged kneeling, immunocompromised, alcoholism, COPD, chronic renal failure, local corticosteroid therapy, and previous bursal inflammation. A lateral bursal aspiration is often necessary. In a lab, a threshold of bursal aspirate nucleated cell count can be obtained. In addition, a gram stain and culture of the aspirate can be examined, but may be negative. A more sensitive test method for bursitis is to inoculate the aspirate into a liquid media. Clinically, administer a comprehensive knee exam that includes LE alignment, effusion, joint line tenderness, ROM, and muscle tone/strength. Signs of septic prepatellar bursitis includes: swelling, pain, erythema, warmth, hallmark is local tenderness to palpation. It is atypical to have pain with joint ROM with the exception of extreme flexion compressing the bursa. Examine the 4 cardinal signs of inflammation: calor (heat), dolor (pain), rubor (redness), and swelling. There is a lack of prognostic studies on prepatellar bursitis. Pain and knee function resolution will be dependent on the severity, presence of disease, extent of tissue damage, and presence of coexisting conditions. For minor acute injuries, the condition can be resolved within 2-8 weeks of proper knee management. McCarthy EM, Murphy CL, Doran MF, Cunnane G. Infrapatellar bursitis: an occupational legacy. J Clin Rheumatol. 2011;17(1):49-50.